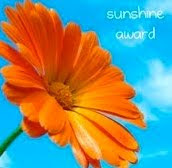 Well, my friend Carrie over at Carrie's Busy Nothings just sent me the Sunshine Award for "bloggers whose positivity and creativity inspire others in the blogging world." So, first of all, thank you, Carrie - I appreciate that (although I'm not quite sure I live up to it!). And secondly, it's a good opportunity for me to introduce you all to some other lovely blogs.... so here we go. Incidentally, be sure to stop by Carrie's blog in which she discusses everything from book reviews to couponing tips, always with a sense of humor. A Note to My Nominees: I am linking your blogs because I enjoy them and believe my readers will too. However, lack of participating in this meme will not instigate a series of unfortunate events in your life, nor will it erase your hard drive or steal your identity or any such thing... So no pressure to participate unless you feel like it! And incidentally, if you're one of my blogging friends and I noticed you already received this award from Carrie, then I've linked it on to someone else... but I love your blogs too! 2. Geninne's Art Blog - a visual treat and great source of inspiration...You'll love her birdies! 3. 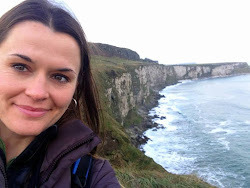 Kathryn Estelle - a "kindred spirit" I "met" through blogging...another artsy-craftsy person! 4. Rainey Day Photography - her husband and I grew up together - you'll love her photos! 5. Nesting Place - great home decorating tips, and always a great sense of humor. 6. Paint in My Hair - another visual treat! 7. Lemonade Adventures - how to deal when life hands you lemons... from an amazing lady who's making lemonade. 10. The Vintage Magpie - I'm a sucker for cute, scruffy little animals (especially when they remind me of my cute, scruffy little dog!)... you'll love these! 11. Anna Maria Horner - I'm also a sucker for blogs filled with colorful, pretty things and lots of great photographs! 12. French Press Knits - because knitting is another one of my many hobbies... if it's one of yours too, you'll love this blog! So, there are my 12... I follow quite a few other blogs which could easily win this award too, but you'll just have to check some of them out in my links! You are too kind Beth :) Thank you so much for this lovely award and for that great blog list...must go and check them out. Hugs from a very sunny Mexico. Wow, I just found your blog and you are so talented! I checked out your murals and was really impressed with your work. I've done a few murals, but not quite as extensive as what you've done here. I think it's awesome that you seek to glorify Christ in all you do. I'm becoming a follower so I can continue coming back for more inspiration. Thank you, LeAnn! I appreciate your stopping by, following, and your comments! Beth, thank you so much! I haven't had time to blog lately. I'm trying to catch up on making a few comments this morning. I haven't forgotten you!